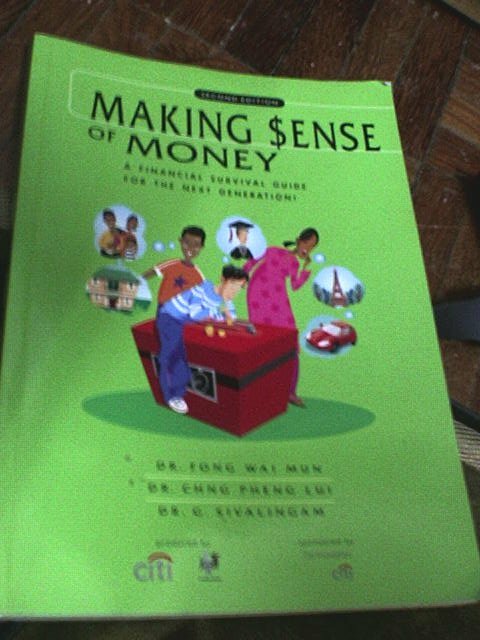 I read a book with title “Making sense of Money .. “..
and it claim to be financially explained in a layman term. somehow reminding me about something at my childhood age. what is the sum of 5+7 ? .. he then said don’t know how to count..
then.. the guy change the question a bit..
“sebelum keluar rumah, katakanlah dalam poket kamu sudah ada 50sen ..
selepas itu apabila pakcik Atan memberi kamu sebanyak 50sen ..
kemudian makcik Aminah memberi kamu pula sebanyak 20sen lagi ..
a lot of thing getting easier to be understood. p/s : Err.. when are we gonna celebrating “Teacher’s Day ” again, it is no public holiday right …?